Faced with the subject of refugees and asylum seekers on a daily basis, this vibrant and life-affirming musical could not be more timely. Bringing humanity to the stories of those fleeing war-torn lands, the production is a celebration of the power of teenagers and a community with a cause, offering a strong, positive and unifying message. 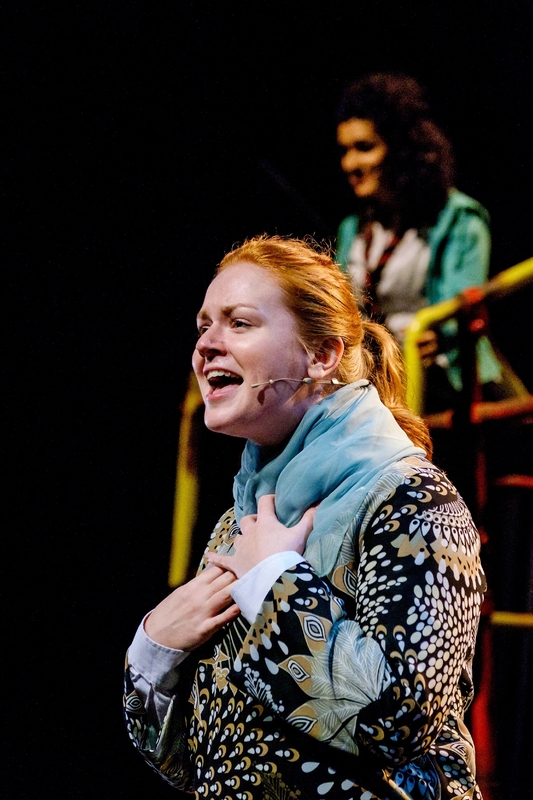 Cora Bissett and David Greig’s song-filled Scottish drama is based on the true story of seven feisty teenagers, whose lives change forever when their school friend and her asylum-seeking family are forcibly taken from their home to be deported. The young women are galvanised to take a stand and fight for her life, taking on the government and succeeding where others had failed, and inspiring the community to back its residents. The real-life Glasgow Girls became some of the most vocal and powerful pro-asylum seeker campaigners in the country in 2005, appearing in two TV documentaries and becoming vital media spokespeople. Cora, from Glenrothes, said when she first approached the young women, they were somewhat sceptical about her ambition to turn their story into a musical. “They weren’t theatre people per se but when they looked at my track record and worked out I wasn’t a nutter, they took a giant leap of faith and went for it,” she says. An inspiring show – the Glasgow Girls. Glasgow Girls was a smash hit when it first played in 2012, filling the Citizens’ Theatre in Glasgow to the gunnels and packing London’s Theatre Royal Stratford East. “We were always keen to give it another, fuller, more widespread life across the UK,” says Cora. “Every time we’ve mounted the show, it’s resonated in a different way, depending on what was happening in society. “It couldn’t be more timely and prescient as migration and the struggles of refugees are increasingly one of the most important human issues of our day. The show is also centred on the fact that the teenage girls found the strength to make their voices heard and change their world. “Teenagers are often vilified but the truth is, these girls were inspired to become law changers and activists,” says Cora. Cora explains that the term ‘Glasgow Girl’ is a “statement of intent” which can be applied to anyone, whether a man, woman or child who welcomes all cultures to their country. The music styles are as diverse as the characters within the story, featuring songs across genres including electronic grime from Patricia Panther, reggae-dub from Scots-Asian rapper MC Soom T, folk-rock from Cora and original compositions by the Kielty Brothers. There’s a strong message to be conveyed in Glasgow Girls yet Cora insists the audience won’t feel as if they’re being given a lecture. “Nobody comes away feeling as if they’ve been hit by a social policy lesson. You’re coming to a theatre, not a lecture. Essentially, it’s a great night out. You go on a journey with these characters, you love Glasgow and its community and then you might have a thought that ‘oh my God, I’ve learned a bit about what these asylum seekers are going through’. Glasgow Girls sing their hearts out. Cora is an award-winning director, actor, musician. Her band Darlingheart toured with Radiohead and Blur in the 1990s before the momentum of a career in acting and directing took over. Her best-remembered TV role was as a barmaid in Rab C Nesbitt, and she was also in gritty award-winning film Red Road in 2006. In 2009, she set up Pachamama Productions, and launched her debut production, Roadkill, during Refugee Week Glasgow, 2010. 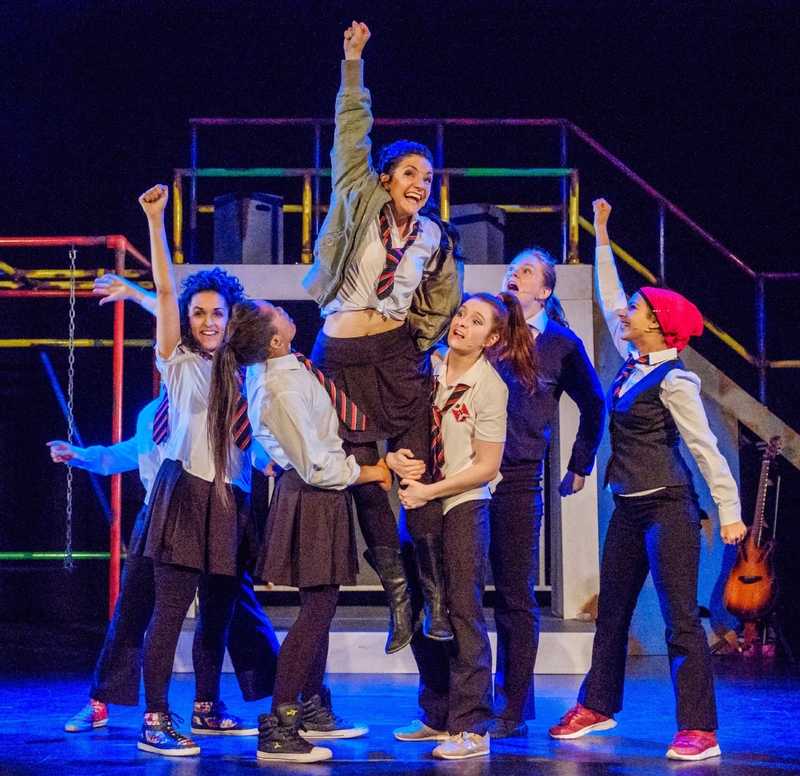 Glasgow Girls is presented by Pachamama Productions, National Theatre of Scotland, Theatre Royal Stratford East & Regular Music, and is supported by Citizens Theatre and Richard Jordan Productions Ltd.